Earn up to 25,992 reward points. Celebrating 15 years with exquisite tonewoods, signature features and versatile electronics. 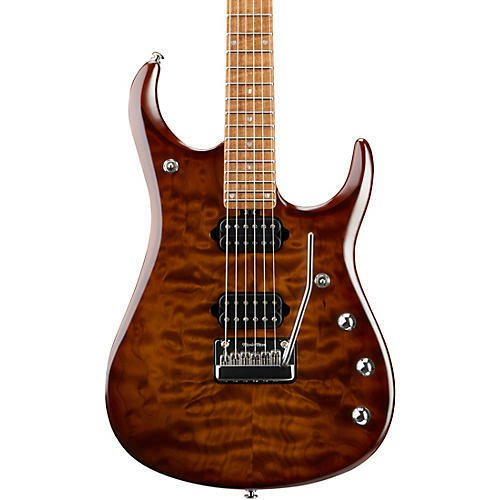 The Music Man JP15 Roasted Quilt Maple Top Six-String Electric Guitar is the first John Petrucci production model to feature a roasted maple fretboard and roasted maple top. The African mahogany body features a Sahara Burst satin finish and a pair of DiMarzio Illuminator humbuckers. The roasted, figured maple neck is finished in gunstock oil and wax. Piezo, 20 dB gain boost and custom pearl JP15 inlays come stock on every JP15. Available in 6 or 7 string with your choice of flame or quilt top. Hard case included. Grab this incredible-looking guitar for yourself. Order today.